Why didn’t I think of this??? A Champagne Gummy Bear! 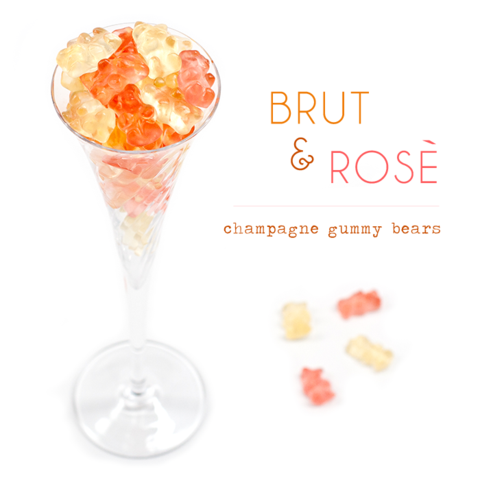 Whether you just enjoy Champagne like me…or the lovely Gummy Bears alone this combination must be amazing right? I stumbled upon this photo that lead me to a website called Sugarfina. They have natural champagne bears from Germany! They are only 5 dollars so I will definitely be ordering my own bag. Before I completely fell off this idea I had to do some research. However could I make my own champagne gummy? I found a “how to” from TheCafeWellness.com and I can say I will attempt this out myself in the future! 1.) In medium bowl, mix water and gelatin, stirring until it forms a semi-hard substance. Let sit for 10 minutes. 2.) In medium sauce pan add sugar, orange juice, and lemon juice. Mix and bring to a boil. 3.) Add in gelatin mix and champagne and stir for 1 minute. Turn off heat and allow to cool for 5 minutes. 4.) Pour mixture in baking sheet or pan and gently place in refrigerator! BOOM! Champagne Gummies in about 2 hours. They recommended Great Lakes Gelatin.